It’s clear from the outset that the rather unusual young man who approaches Christ in today’s Gospel reading has no hidden agenda. He didn’t go to try and trick the Lord, as did the lawyer and some of the Pharisees. He was sincere. This is proved by the fact that when he heard Christ’s final exhortation, ‘he departed in sorrow’. He really was looking for the kingdom of God. This is why Saint Mark the Evangelist ‘supplements’ Matthew, saying ‘Jesus looked at him and loved him’. Young and rich yet being concerned about eternal life is a rare phenomenon. Young people never have much time for preachers. Today, when young people- and not only them- hear someone talking about eternal life, they usually reply: ‘A bird in the hand is worth two in the bush’. But it seems that the young man who went to Christ wasn’t content even with the ‘one bird’, but wanted much more and, indeed, wanted it now. From a child he’d kept his conscience clean by doing God’s will, as far as possible and by his own lights. And certainly it’s no small thing for a young person to make a conscious effort to observe God’s commandments. What’s even more impressive is that, despite his far from negligible efforts, he’d not fallen into self-satisfaction or vanity. So, feeling that he’d probably done enough for eternal life, he didn’t say ‘Well done, me’, but asked ‘What more must I do?’ This question is a sign of maturity and prudence, virtues not often found in the young. Another young man, who was of an exactly opposite, egotistical frame of mind, answered the exhortation of a great Christian author to get to know Christ and make Him the guide of his life by saying: ‘I fear that Christ and His commandments will neuter my abilities and clip my wings, so that I won’t realize my dreams’. The Nobel prize winner replied: ‘If you know Christ properly and enter that arena of asceticism of His Church, He won’t leave you in peace until you’ve used your gifts to the full’. When the man asks Christ ‘What more must I do?’, he sets the foundations for real spiritual progress. 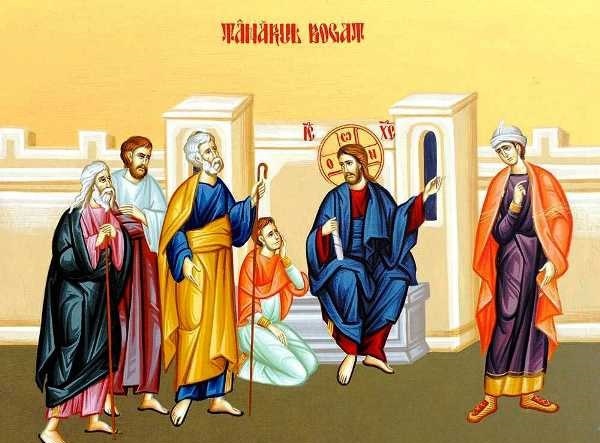 Saint Sisoё used this question every day as a spring-board for new struggles, and rose thus to the heights of humility: he saw Christ coming ‘in glory’ to receive his soul and begged to be allowed to live a little longer so that he could make a start on repentance. On the other hand, those who are satisfied with their supposed virtues and who admire themselves for their moral achievements at best stagnate dangerously and will wake up one night, like the foolish rich man did, and hear a voice saying: ‘Who will receive what you prepared?’. The otherwise admirable young man who went to Christ hadn’t foundered in the mire of self-satisfaction, but had become trapped by one passion: possessiveness. And it appears he was firmly hooked on the love of his possessions. Saint John Chrysostom was astonished that someone who came to Christ with such joy and willingness should react the way he did when he was asked to forsake everything and follow Him: he had no answer, but, silent and dejected, departed. And just think how extremely attractive Christ’s proposal was: ‘Do you not see how many prizes, how many crowns he awards in this arena?’, asks Chrysostom. It’s no small thing, he says, to be a step away from perfection. It’s not to be scoffed at when you’re promised ‘treasure in heaven’. Had the young man been thinking more clearly, he’d have realized that, in the end, not only would he not have lost anything, but Christ would have added ‘not merely more but even greater, as great as the distance from the earth to the heavens’. Had he followed Christ, he might have attained the stature of the Apostles or Anthony the Great or Basil the Great, since for those two spiritual giants (as, indeed, for many others) this Gospel reading was the starting-point for their wonderful devotion to Christ. In times of poverty because of an economic crisis, it may be that a lot of people will claim that this Gospel reading doesn’t have much to say to us. But it’s not only the amount of possessions that keep us in thrall and prevent us from following Christ. Abba Dorotheos wasn’t scaremongering when he advised: ‘Believe me, brethren. If anyone has given in to even one passion, they’re in danger of losing their soul. You can do ten good works, and one bad thing that you’re a slave to will outweigh them. Just as an eagle that almost escapes a snare might be caught by just one talon, so might the soul be caught. If you’re bound to just one passion, you can be overcome any time the enemy chooses. A prime example of this was the priest, Sapricius, who withstood torture for his faith in Christ, but lost not only the crown of martyrdom, but also his soul, because of his persistent resentment towards his friend and later martyr Nikiforos, who had begged Sapricius to forgive him. If after that, we’re astonished and ask the Lord, as His disciples did, who can be saved, we can find solace in His answer: ‘For God, all things are possible’. Perhaps another way in which the parable is relevant in today’s world is with ‘virtue-signalling’. It’s easy for the rich and famous to parade their concern for the poor and oppressed, but unless they’re prepared to reach into their deep pockets and provide succour to actual individuals, then it’s mere posturing [WJL].